"It's like the meanest, wildest monkey running around my head, constantly looking for ways to bite me." That was how Kirsten Pagacz described her OCD to her therapist on their first session when she was well into her 30s--she'd been following orders from this mean taskmaster for 20 years, without understanding why. Initially the tapping and counting and cleaning and ordering brought her comfort and structure, two things lacking in her family life. But it never lasted; the loathsome self-talk only intensified, and the rituals she had to perform got more bizarre. By high school she was anorexic and a substance abuser--common "shadow syndromes" of OCD. By adulthood, she could barely hide her problems and held on to jobs and friends through sheer grit. Help finally came in the form of a miraculously well-timed public service announcement on NPR about OCD--at last her illness had an identity. 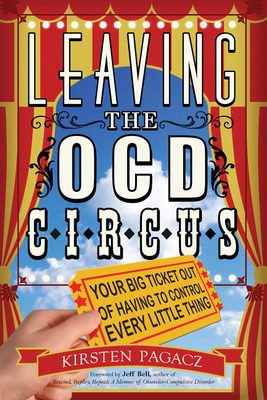 Leaving the OCD Circus reveals the story of Pagacz's traumatic childhood and the escalation of her disorder--demonstrating how OCD works to misshape a life from a very young age--and explains the various tools she used for healing including meditation, cognitive behavioral therapy, yoga, exposure therapy, and medication. Pieces of her art scattered throughout the book add depth and humor to her stories.